An open relationship with Israel serves India well and it’s about time Tel Aviv gets the recognition it deserves from New Delhi. 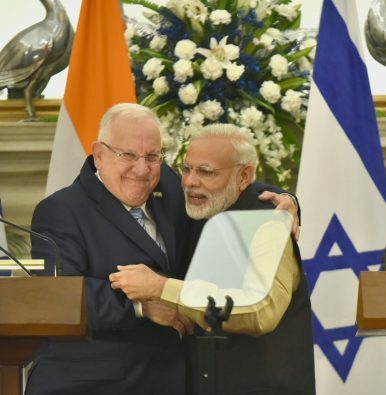 Israeli President Reuven Rivlin was on a six-day trip to India recently — the first by the Israeli head of state. It is anticipated that in an historic first, Indian Prime Minister Narendra Modi will visit Israel in January 2017 to mark the 25th anniversary of the establishment of diplomatic relations between the two countries. He will become the first prime minister of India to visit the country. Modi had visited Israel as chief minister of Gujarat in 2006. As Indian prime minister, he had met his Israeli counterpart, Benjamin Netanyahu on the sidelines of the UN General Assembly’s annual session last year. The Israeli president underscored the “positive and growing cooperation between our countries in many areas of defense and security” and suggested that the two states “face a common challenge in fighting terrorism and radicalism.” He reaffirmed Israel’s “commitment to the fight against global terrorism” and “to carry the great potential of this partnership into reality” even as he offered his country’s expertise to India on a range of areas such as cyber warfare, energy, agriculture and defense. Israel may finally have found in the Modi government a partner with whom it can work without any pretensions. A hallmark of Modi’s foreign policy has been a self-confident assertion of Indian interests. This is reflected in his government’s moves vis-a-vis Israel, marking a distinct break from unnecessary and counterproductive diffidence of the past. Despite sharing more than two decades of diplomatic ties and working closely on defense, counter-terrorism, agriculture, and energy-related issues, no Indian prime minister or president has ever visited Israel. This may change with a possible Modi visit early next year. There has been a steady strengthening of India’s relationship with Israel ever since the two established full diplomatic relations in 1992. It is a tribute to India’s former Prime Minister Narasimha Rao’s foresight that he was able to lay the basis of the Indo-Israeli partnership. In contrast to the back-channel security ties that existed before the normalization of bilateral relations, India has been more willing in recent years to carve out a mutually beneficial bilateral relationship with Israel, including deepening military ties and countering the threat terrorism poses to the two countries. Over the years, the Indian government has also toned down its reaction to Israel’s treatment of the Palestinians. India has also started denouncing Palestinian suicide bombings and other terrorist acts in Israel, something that was seen earlier as rather justified in light of the Israeli policies against the Palestinians. India is no longer initiating anti-Israel resolutions at the United Nations and has made serious attempts to moderate the Non-Aligned Movement’s anti-Israel resolutions. This reevaluation has been based on a realization that India’s largely pro-Arab stance in the Middle East has not been adequately rewarded by the Arab world. India has received no worthwhile backing from the Arab countries in the resolution of problems it faces in its own neighborhood. There have been no serious attempts by the Arab world to put pressure on Pakistan to reign in the cross-border insurgency in Kashmir. On the contrary, Arab nations have firmly stood by Pakistan, using the Organization of Islamic Conference (OIC) to build support for Islamabad. If Arab nations, such as Jordan, have been able to keep their traditional ties with Palestine intact while building a new relationship with Israel, there is no reason for India not to take a similar route, which might give it more room for diplomatic maneuvering. Keeping India’s wider strategic interests in perspective, successive Indian governments since the early 1990s have walked a nuanced line between expressing genuine concern for the Palestinian cause and expanding the country’s commercial and defense ties with Israel. India is the world’s largest buyer of Israeli weaponry and was Israel’s third largest trading partner in Asia in 2013, just after China and Hong Kong. The domestic political milieu continues to exert its substantial influence on the trajectory of India-Israel relations. Israel has been a good friend of India but New Delhi continues to be shy of demonstrating its friendship. At crucial times, when India needed Israeli help, it received it unreservedly. Israel was willing to continue and even step up its arms sales to India after other major states curbed their technological exports following India’s May 1998 nuclear tests. Israel provided India with much-needed imagery of Pakistani positions using its UAVs during the Kargil War in 1999, which was instrumental in turning the war around for India. When India was planning to undertake a limited military strike against Pakistan in June 2002 as part of Operation Parakram, Israel supplied hardware through special planes. The terrorism that both India and Israel face comes not only from disaffected groups within their territories; it is also aided and abetted by neighboring states, increasingly capable of transferring weapons of mass destruction to terrorist organisations. And yet previous governments had been reticent in acknowledging Israel’s partnership. In diplomacy, public affirmation of friendships at the highest levels is often as important as drawing red lines for adversaries. The Modi government is doing well by repudiating the discredited Israel policy of its predecessors. An open relationship with Israel serves India well and it’s about time Tel Aviv gets the recognition it deserves from New Delhi. 2015 was a momentous year for Indian foreign policy, showing that leadership can truly matter.